Callaway have gone in a totally new direction with the clubhead design in their new Epic Flash range. Their Epic Flash Sub Zero driver benefits from the new Flash Face technology developed by Callaway. This has been created using Artificial Intelligence and through machine learning, this club face has evolved to this unique subtle ripple finished design. This increases ball speed at impact which allows for a longer carry and therefore greater distances from the tee. The face is forged from a special Titanium. This is heat treated for an extended period of time which produces an extremely strong and flexible face design for speed. Callaway have strengthened the clubhead in this driver by the introduction of 2 internal jailbreak bars. These bars stiffen and stabilise the sole and crown at the point of impact. This places a higher impact load on the face which in turn results in faster ball speed. For the first time, the Epic Flash Sub Zero driver benefits from an Adjustable Perimeter Weighting (APW) system The 12 gram weight can be slid along the track and can be positioned to suit your swing. If the weight is positioned closer to the heel it tends to promote a draw, with a fade bias if situated nearer to the toe. Further permanent weight is embedded forward in the sole of the head. This pulls the Centre of Gravity (CG) lower and forward which has the effect of reducing spin. This driver, due to its head design and weighting system, creates a high Moment of Inertia (MOI) and lower spin rate which gives added forgiveness and extra distance. 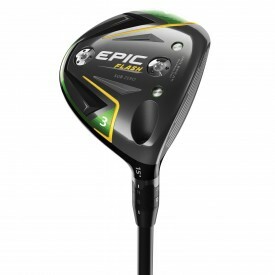 There are 2 loft options for this driver, This being 9/10.5 degrees of loft together with 2 stock shaft options. Those options are a Project X HZRDUS Smoke shaft or a Mitsubishi Tensei AV shaft. All drivers are fitted with a Golf Pride premium tour Velvet Align grip with a special green reminder ridge. This driver is the future of golf.